The feet tend to take a lot of abuse and they almost never get a day off as most people are always on their feet whether they are working or playing. While keeping active is always a good thing, it can leave you with achy and sore feet. But, if you are a fan of yoga, you should know that there are some poses that can be very useful in keeping your feet healthy so that they can withstand the almost constant abuse. Some of the best yoga poses for better foot health include the following five. If you are going to do any standing yoga pose, mountain pose is always going to be your foundation. However, it is also a helpful pose for your feet as it helps improve balance, focus and your general posture. Healthy posture is vital for foot health as it reduces irritation and inflammation of the foot muscles and joints. 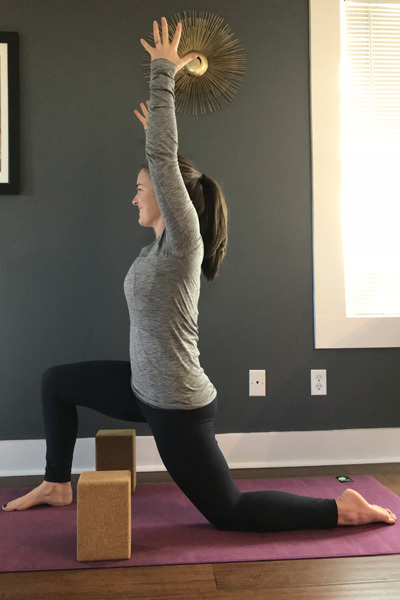 Mountain pose helps you focus on your posture and stance which in turn ensures you are more aware of your standing habits to minimize the pressure on certain parts of the foot which tend to be the most problematic such as the heels. * Start by standing with your feet parallel and about hip-width apart. * Spread your toes apart and then distribute your weight evenly across both feet. * Make sure that you do not lean forward or backward as you apply even pressure on all four corners of each foot. * Keep your legs straight but not locked and make sure that your hips are aligned with the ankles. * Breathe in deeply and then stretch the spine towards the ceiling with the arms at your side. * Hold the pose for about 3 minutes and try to focus on both maintaining the correct position and your steady breath. Tree pose is a classic yoga pose that will help to improve your balance and the distribution of weight across your feet. This pose will entail transferring weight from one foot to the other which in the long run will improve your balance. Also, the weight transfer will help to stretch the micro muscles around the shin and foot. * Start by coming into mountain pose. * Slowly shift your body weight to the left foot, bend your right knee and then use your right hand to bring the sole of your right foot to your inner thigh, calf, or ankle. * While in tree pose, keep your pelvis centered and parallel to the floor and your back straight. * Bring both your hands in front and together to form anjali mudra (prayer hands). Lift your hands above your head to come into the full expression of the pose. * Hold the position for at least 10 seconds and then release before repeating for the other foot. Warrior 1 or Virabhadrasana 1 in Sanskrit is also a classic yoga pose that can come with numerous health benefits for the feet. This pose is all about stretching your feet and strengthening the foot muscles but it can also help to reduce heel pain. And it can also help lift flat arches as it targets specific arch muscles to help lift the feet. * Start in mountain pose. * Take a long step forward so that your feet are 3-4 feet apart and hips width distance. * Make sure your body and front foot face forward and turn the back foot 45 degrees to provide some balance. * Bend your front leg until the front knee is directly above the ankle to form a 90-degree angle. * Lift your arms straight up. Hold this pose for 30 seconds before switching to the other foot. When you want to release tension on your feet Thunderbolt Pose is a great option. And this is because it entails sitting on your heels which helps to press into a natural pressure point in the arch. * Start by kneeling on the floor. * Bring your knees to touch and press the tops of your feet flat against the floor. Your heels should be as close to one another as possible. * Now lower the weight of your body onto your heels and then sit with a straight posture and your hands resting on your thighs. * Hold this posture for about one minute before releasing. * Finish by stretching your legs out in front of you. Give your legs a little shake or find movement before repeating the routine again. Toes Pose is a popular Yin Yoga pose that targets the plantar fascia ligament, one of the most problematic ligaments in the foot as it is where the pain that comes from plantar fasciitis originates. This pose aims to stretch, strengthen and elongate the fascia, and in doing all this it helps to keep the soles of the feet in great shape. * Start by sitting in a kneeling position. * Next, lift up on the toes (your toes are curled under) with the knees still anchored in front of you and still on the ground. * Gently let your weight settle back onto your heels and hold this pose for a minute or two. * Make sure that you breathe calmly and deeply through this pose, and also try to imagine the fascia becoming more flexible and elongated. Your feet have to carry a lot of weight every day and so keeping them in good shape is vital not only for their health but also for your overall well-being. And while there are many ways of doing this, yoga poses like the five above are a great starting point. Does yoga improve posture? The answer is yes! Yoga is great for overall back care and spinal health. The best yoga for better posture includes a full range of motions: forward folding (spinal flexion), backbends (spinal extension), twisting, shoulder opening, hip flexors and hamstring lengthening, and retraining the body to move in better, healthier ways. It is also important to strengthen muscles that have become weakened and/or overstretched. Posture issues and back pain are often caused by poor biomechanics and muscular imbalances due to habitual patterns of movement (or lack of movement), imbalances of strength and flexibility, injury, and sometimes genetic predisposition. In this blog post, I will be focusing mostly on gentle yoga stretches for good posture. These good posture exercises help release tension and tightness in the muscles that often become tight, shortened or overstretched when we spend much of our time standing, sitting, or walking with poor posture. Cat-Cow is one of the best exercises to improve posture. I include cat-cows in every single yoga class I teach. Why? Because it stretches the postural muscles, encourages the healthy movement of the pelvis and requires the core to gently engage. Cat-cow also helps release tension in the neck and shoulders. 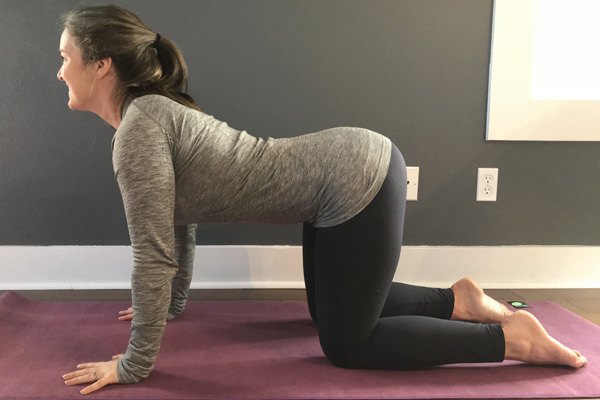 To practice Cat-Cow, come into a tabletop position on hands and knees with your knees directly underneath your hips and your hands directly underneath your shoulders. 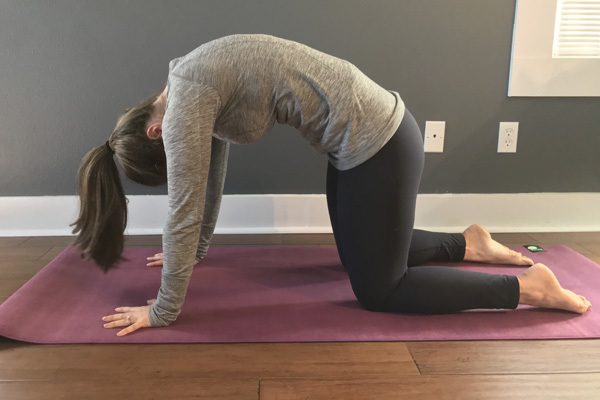 To start, find length through your spine, draw your lower belly in and up to support your lower back and lengthen your tailbone straight back behind you. Take a few rounds of breath here and experience the length of your spine and the subtle engagement of your core. Use an inhale breath to lift your tailbone up towards the sky, draw your belly down, pull your chest forward between your upper arms and finally turn your gaze forward and slightly up while you maintain your core engagement. This will draw your spine into a gentle backbend. You want to think of articulating through each vertebra. On your exhale breath, tuck your tailbone under, pull your navel to your spine as you round your back; Continue to round your back, puff up the space between your shoulder blades, and draw your gaze toward your knees. Continue this movement for 10-12 rounds of breath. 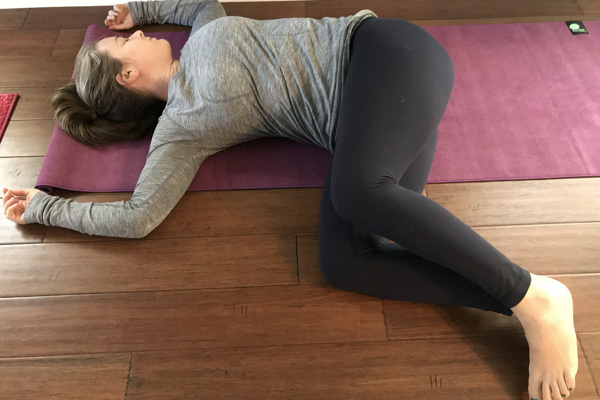 Reclined cobbler’s pose is one of my favorite yoga poses because it is deeply restorative, reestablishes the lumbar curve, opens the chest, and softens the muscles of the groin and inner thighs. The forward head, shoulders rounded forward, spine rounded forward posture is quite prevalent in today’s society. 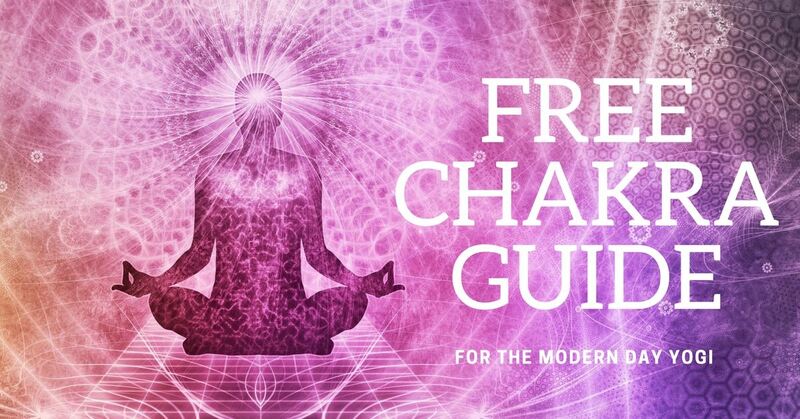 This forward head, “C” shaped posture is reinforced in our workplaces (computer hunch), our cars, and our homes (super soft couches that you sink into). When we allow our shoulders to round forward, the muscles in of our chest get tight, weak and shortened, the muscles between the shoulder blades become weak and overstretched, and the muscles of our neck and upper shoulders become tight and prone to strain. If you notice your shoulders rounding forward during your workday, take a minute and do some shoulder rolls. 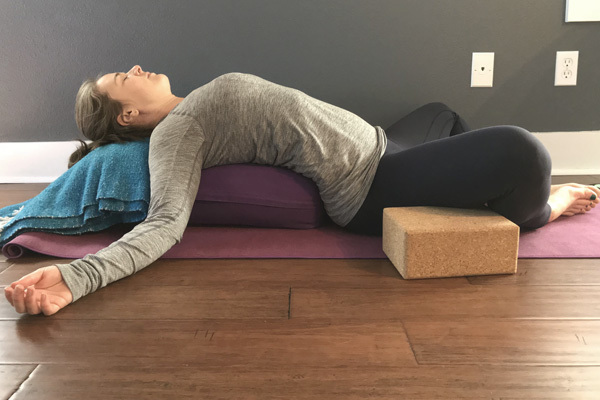 To practice supta baddha konasana, or reclined cobbler’s pose, you will want a bolster (or a couple of pillows or a rolled blanket), a blanket or folded towel, and two yoga blocks (or cushions of the same size). Place your bolster or rolled blanket lengthwise behind you and take your folded blanket or towel at the far end of your bolster (this will support your head and neck). Take a seat with your sacrum at the short end of your bolster, carefully lower yourself down onto your bolster, support your head with the blanket/towel (optional), and bring the soles of your feet to touch as if you were coming into butterfly pose, your knees drop out to the side like the pages of a book. If you feel like you need support for your legs, slide your blocks or extra cushions underneath your thighs/knees. Settle into the posture and allow your entire body to relax. Hold 4-7 minutes. Supported Bridge Pose benefits your lower back by re-establishing the lumbar curve. The lumbar curve is often flattened in those who sit for the majority of the day. Some individuals will have a deep lumbar curve typical of what you would see in gymnasts. A deep lumbar curve compromises the integrity of the vertebrae and discs of the lower back. For supported bridge pose you will want to have a bolster, block or a firm pillow. Lay down on your back and bring your feet as close to your bum as you can with your feet and knees both hips-width distance. Stretch your fingertips down toward your heels. From this pose, press into your feet and lift your hips, belly, and chest up toward the ceiling on an inhale. On an exhale breath reverse the motion. Begin at the top and roll your spine down one vertebra at a time. Repeat 3-7 times. The active version of bridge pose strengthens the glutes, back, abdomen and legs. On your last active bridge pose slide your bolster, block, or pillow underneath your sacrum, so your hips and lower back are supported. Keep your legs bent for a few minutes. If the posture still feels okay after a few minutes you can play with lengthening your legs long along the floor. This will lengthen your hip flexors, but please be mindful of your lower back. If you experience any lower back pain then bend your knees and bring your feet back down to the earth. Hold the pose for 5 minutes. Low lunge, or anjaneyasana, is a foundational yoga pose. 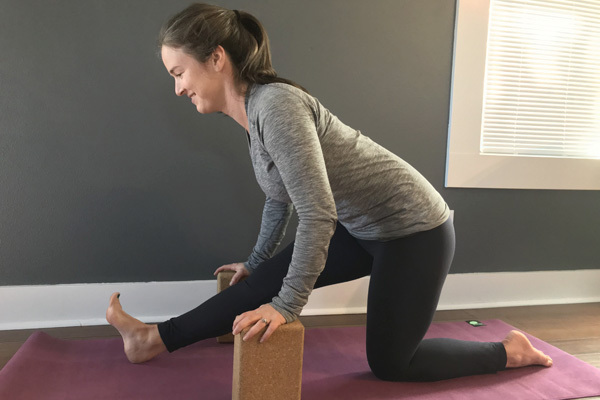 When linked with Half Splits or Ardha Hanumanasana, it is a great yoga exercise to improve posture because it opens the quadriceps, hip flexors, and hamstrings. Low lunge with the torso upright also trains the paraspinal muscles (the muscles that run along your spine on either side) and abdominal muscles to hold the torso stable. Come into a standing forward fold with your feet hips-width distance at the top of your yoga mat. Bend your knees enough to bring your hands down to your mat. Step your right foot towards the back edge of your mat and bring your right knee down. Make sure that your left knee is directly above your left ankle. To begin, bring your torso upright and if you feel stable take your arms up overhead. 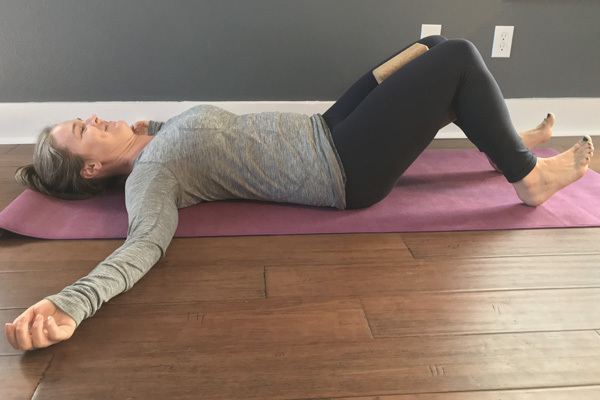 Bring your awareness to your lower back and notice if you’re collapsing; if you are, your lumbar curve will be deeper and your belly will have softened forward. If this is you, draw your lower belly in and up. You can think of lifting your pubic bone up toward your ribs, which will teach you to use your core muscles to support your lumbar spine. Hold this posture five to ten rounds of breath and then release your hands to the ground (or onto your blocks). For half splits you will wiggle your left foot an inch or two forward and then shift your hips back, so your right hip stacks over your left hip. With your left leg extended long out in front of you flex your foot and dray your toes back toward your shin. This posture lengthens your hamstrings. Hold this pose 5-10 rounds of breath. When the hamstrings become shortened they pull on the pelvis via the sit bones (ischial tuberosities) and this pulling posteriorly tilts the pelvis and flattens the curve of the lower back. 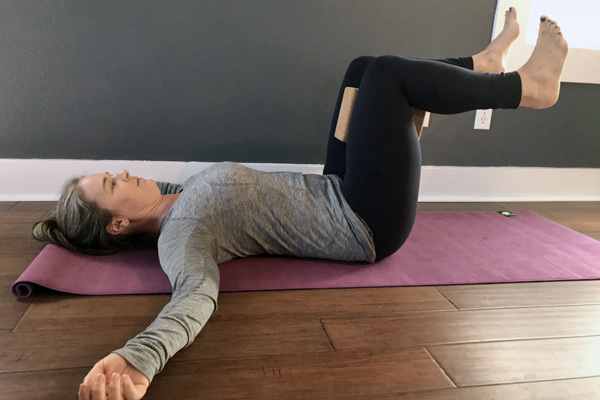 Supine pelvic tilts are incredibly helpful when it comes to rehabbing low back injuries and teach the muscles of the abdomen, pelvic floor, and inner thighs to engage. 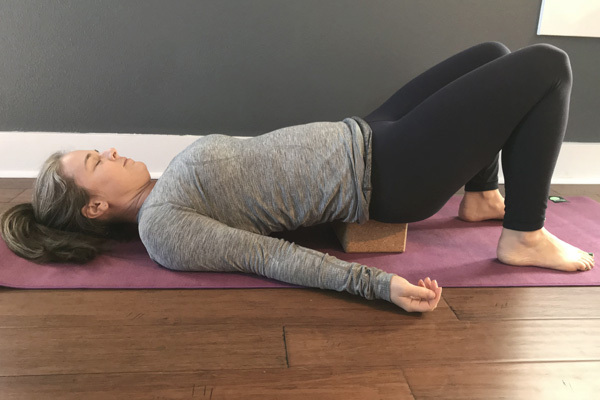 You will want one yoga block to practice supine pelvic tilts. Lay down on your back like you’re setting up for bridge pose (see exercise #3). Put your feet close to your bum to start. Place your block between your thighs on its narrowest setting. Level 1. Keep your feet on the mat. Bring your hands to your lower abdomen and pubic bone, so you can feel the movement. Inhale a full deep breath and as you exhale curl your tailbone up off the mat and draw your navel toward your spine. Your lumbar spine will press into the mat beneath you. As you inhale, reverse the tilt: tailbone down, belly lifts and there is a space underneath your lower back. Make sure to squeeze into your block during this exercise. Repeat 10-20 times. Level 2. This is more of a core strengthener than a pelvic tilt, but it’s equally important. Stay on your back, keep your block between your thighs, bring your shins to parallel with the floor. From here, superglue your lower back to the mat and lower your heels down to tap the mat on an inhale. As you exhale, lift your legs back up to the starting posture. Repeat 10-20 times. Simple Supine Twist not only helps release tension in your lower back, it also helps reduce stress and improve relaxation. It’s also really easy and you can even do it in bed. To practice simple supine twist, make your way onto your back. Draw your knees to your chest and give them a little hug in. Then release your arms out to the side, so they go straight out from your shoulders. Release your knees to the right and turn your gaze toward your left shoulder if it feels okay on your neck. Hold for a couple of minutes and switch sides. Downward Facing Dog at a wall or table is a gentler version of the traditional yoga posture. It helps those who have tighter/shorter hamstrings, tighter lower back or tighter shoulders get the benefits of the posture. Downward Facing Dog stretches the hamstrings, back, and shoulders. The posture also helps people find a long spine and core engagement. To practice Downward Facing Dog on the wall, face the wall and bring the palms of your hands to shoulder width distance on the wall in front of you. Walk your feet back until your back becomes straight. You might need to slide the hands down a bit. You will create an upside down “L” shape with your body. Your spine is lengthened long and your navel draws in to support your lower back. Hold the posture for 10 rounds of breath. Child’s pose is wonderful for those who have tight lower backs. 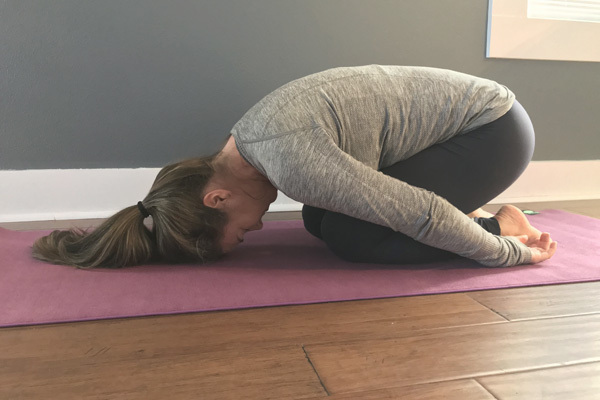 There are two versions of child’s pose: one that works deeper into the hips with the knees wide, and one that works deeper flexion into the spine with the knees together. You don’t need any props to practice child’s pose. Come down into a tabletop position, bring your knees to touch and your big toes to touch and press your hips back toward your heels. Rest your forehead on the mat or on a yoga block or pillow if your head doesn’t reach the floor. Hold for 2-4 minutes. I hope you find this blog post helpful. 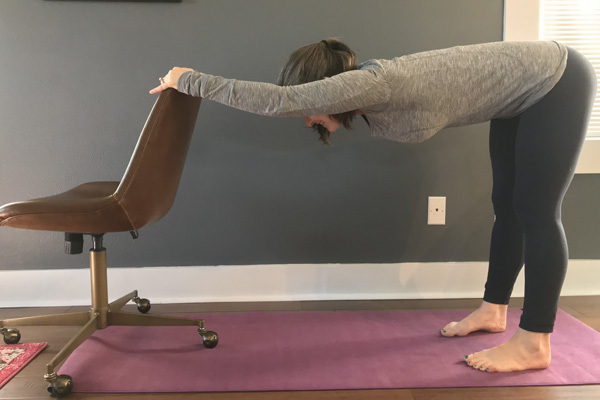 If you would like to learn more about strengthening poses specifically related to the postural muscles, read my post on back strengthening yoga poses. 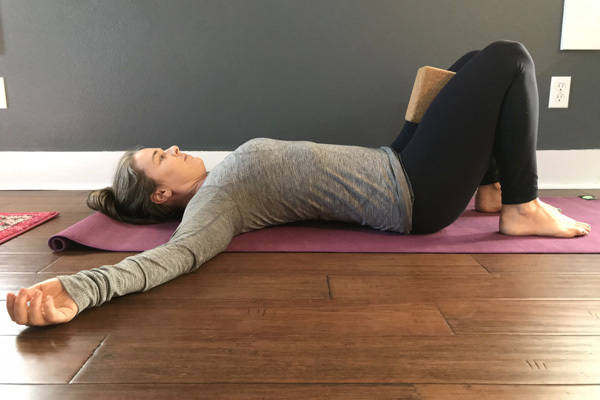 If you have lower back pain, please take a look at my four-part series on back pain, where I discuss restorative yoga for better posture as well as active yoga postures to help strengthen your core and back. Side crow pose was my first arm balance pose. I first learned the “easy” version and honestly didn’t know there was another version for many years. I was pretty content with the version of side crow I had already learned and wasn’t much interested in learning another version. But I began seeing other yogis linking arm balances together using parsva bakasana and eka pada koundinyasa I as transition poses and my curiosity eventually piqued. I now teach side crow pose with two options depending on the students in class. Think “chaturanga arms” as the elbows bend and bring the outside of the thigh closest to the arms on to the tricep of the front arm. If possible, keep the hips lifted off of the back arm. This option will be more challenging, but it’s the correct posture. If side crow pose is new to you try the posture with the back hip on the back arm. If the posture feels steady play with leg variations like transitioning into eka pada koundinyasana I. Remember there are two options for teaching side crow. For beginners teach side crow with the back hip on the tricep of the back arm. They will feel more steady. As the student builds strength and becomes comfortable in this version of the posture encourage them to try the second option. For the second option of side crow the hip is lifted off of the back arm, so only the thigh is in contact with the front arm. This option is more challenging, but rewarding and empowering! Encourage students to bring their head down to a block and learn the muscular engagement to lift the legs. For students whose elbows wing out to the side use a yoga strap to secure their arms to shoulder width distance. Slide the loop of the strap just above their elbows. Use a blanket, bolster, or block underneath their face if they are worried about falling on a hard floor. Place a block under their face to support the head, so they can focus on lifting their feet up. Use a strap around their upper arms to secure the elbows above the wrists. Some students have a tendency to allow their elbows to swing out to the side or collapse inward. When the joints are stacked improperly and the weight of the body is distributed unevenly their is a risk of injury. Use a block in the set up. Have them start with both feet on a block as they twist to the side and set up for side crow. This way their feet will almost be in position for side crow and they can focus on the arms and upper body. Virabhadrasana III or warrior three in English is a strong posture that builds focus and concentration while strengthening the entire body. In this yoga teaching tutorial you will learn to teach warrior three confidently and effectively with these help helpful tips. Warrior three has many benefits. Make sure to share the benefits of the posture when you teach warrior three. Sharing the benefits will help your students discover the purpose of the posture and the focus needed to execute it. The posture builds strength throughout the backside of the body, especially in the ankles, calves, hamstrings, glutes, back and shoulders. It also tones and strengthens the abdomen, ignites our inner fire and improves our concentration and focus. Your students may even find they feel invigorated and energized after practicing warrior three. Sweet! Remember to start with the foundation of the posture. For warrior three the foundation is the foot of the standing leg. In virabhadrasana III the toes of the standing leg foot should be spread wide. Think of distributing weight evenly throughout the entire sole of the foot (all four corners). When standing in warrior three the extended leg is straight back from the hip and the extended leg stretches long. The foot of the extended leg is flexed and the toes point straight down toward floor the floor or the foot is pointed strongly. There is one long line from the heel of the extended leg out through crown of the head. Aside from the standing leg the body is parallel to the floor. Make sure that the hips are level with one another. It is very common for the hip of the extended leg to want to lift up. In warrior three the navel draws in and up to support the lower back (think mula bandha and uddiyana bandha). To bring more stability to the posture draw the lower ribs in toward one another instead of allowing them to flare out and the back to arch. Arms extended long overhead with biceps by ears. Use a focal point or drishti for your eyes. Finding balance in warrior three can be a challenge for many. For students struggling to find steadiness in virabhadrasana three here are three modifications to help them find their balance and build strength in the stabilizing muscles necessary for steadiness and ease. Yoga Journal provides a helpful article about Warrior Three for beginners and advanced practitioners alike. Bring a chair just beyond the top of your students yoga mat. Have the back of the chair facing your student. When the student comes into the posture they will hold onto the back of the chair with their hands. Overtime, increase the amount of time they hold the posture. Make sure to switch sides. If there is no chair available use the wall or a sturdy countertop. Another modification for warrior three is to offer two blocks that they can use underneath their fingertips. Place the blocks shoulder width distance at the top of your student’s mat. Have them use the blocks for balance as they find the alignment through the torso, hips and legs. Some students may need to stay upright in warrior three to work on balancing on one leg. Have students that need to remain upright stand in the center of their mat. As they inhale have them take the arms overhead. On their exhale have them extend one leg straight back behind them and keep the toes on the mat. When they feel steady they can begin to lift the back foot and lower the torso to parallel with the floor. These students may also benefit from using a chair, block or wall for stability for the upper body as well. One of my favorite warrior three variations is interlacing the fingers behind hips and drawing the palms of the hands toward one another. If students have tight shoulders or shoulder strain/pain teach warrior three with hands at heart center. Another arm variation for virabhadrasana three is airplane pose. In airplane pose the arms are extended back and out to the side with the palms turned down toward the floor. Block between the palms of the hands with arms extended overhead. Have students squeeze the palms of their hands into the block to strengthen arms, shoulders and upper back. The following postures will help your students find stability, strength and ease in warrior three. 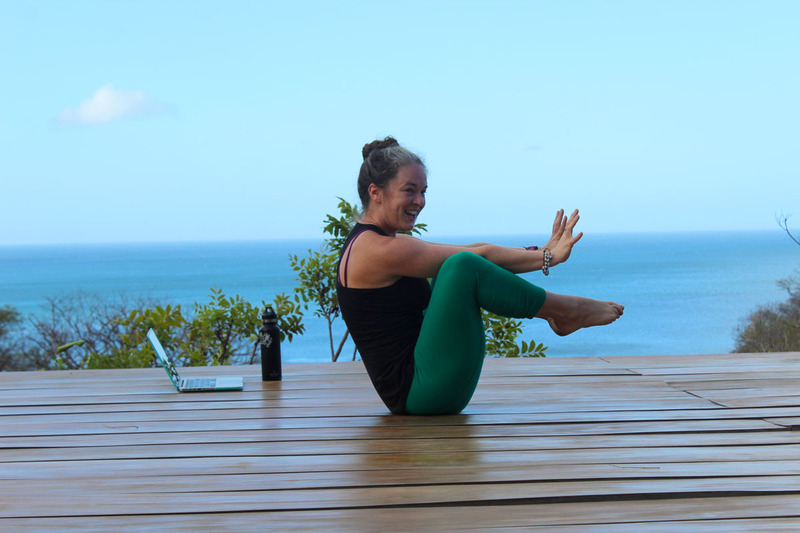 Before you teach warrior three make sure to offer a mix of postures to bring both stability and mobility to the muscle groups and joints used in virabhadrasana. Are you finding it difficult to teach crow pose effectively? When my yoga practice began arm balances were rarely taught in group yoga classes. I struggled with the posture myself for a really long time. But from that struggle I’ve learned nearly every tip in the book for crow pose and here I will share them. We will cover tips for teaching crow pose or bakasana (for all of you Sanskrit junkies), different ways to prep for it, and how to use props to assist entry into the posture. I joke that it took me seven years to get crow pose. Maybe it wasn’t quite seven years, but it took me longer than average. Eventually, once I stopped freaking out about falling on my face or injuring my wrists, shoulders, etc. it happened. I nailed. The funny thing is before I mastered crow pose I was already practicing other arm balances. I guess with bakasana you risk falling flat on your face and I have a deep fear of falling… somewhere in my psyche I have linked falling and failing together into one big massive knot of fear and in crow pose you literally have to face your fears head on. Learn to effectively teach your students to face their fears head on with Bakasana/Crow Pose. Remember to warm up before practicing crow pose. 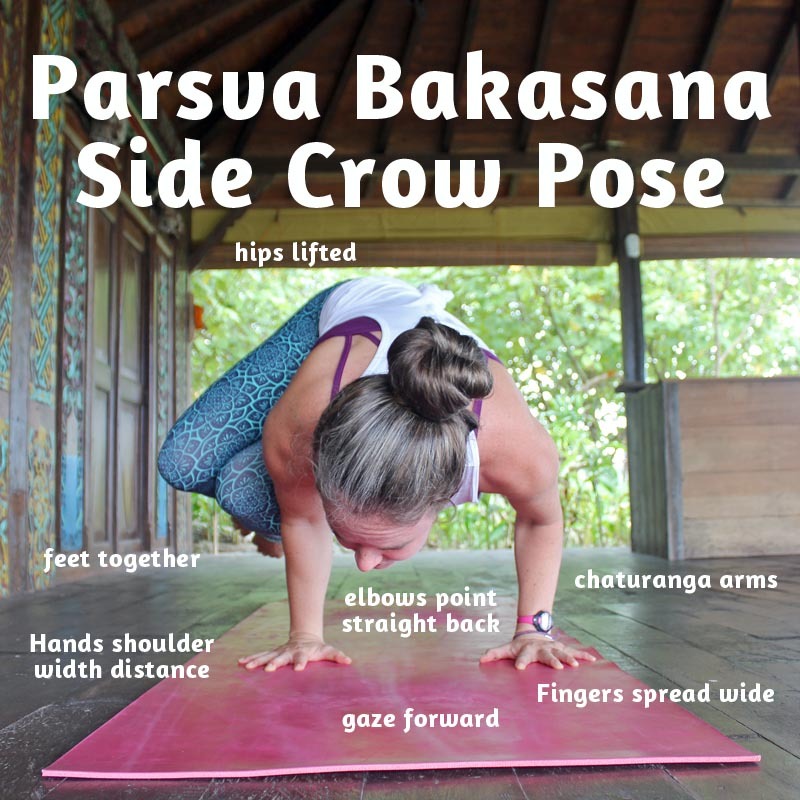 Before you teach Crow Pose prepare by teaching a few or all of the following postures. Brushing up on crow pose basics on retreat in Nicaragua. For students with shoulder or wrist injuries offer seated crow pose or malasana. In seated crow emphasize squeezing upper arms and knees squeezing in toward one another, the engagement of the pelvic floor and lower abdomen and rounding the upper back. 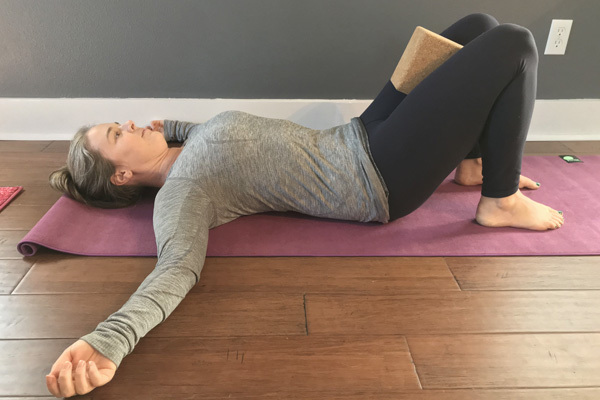 Offer malasana with or without a block underneath the pelvis. Encourage students to lift through mula bandha, press down through the feet, and squeeze upper arms and inner thighs/knees into one another. For a student afraid of falling on their face offer a blanket or block underneath their forehead when you teach crow pose. For a student struggling to find the engagement and balance in bakasana bring them over to the wall. Set them up in malasana about a foot and one half away from the wall. Get them set up to come into the posture and have them press the top of their head into the wall as they work on lifting the feet off the ground. For students struggling to lift their hips high in crow pose suggest a block under their feet. Lifting the hips up high can bring up a fear of falling for some students. If this is the case offer verbal encouragement. You may choose to provide a hands-on assist. For advanced students offer variations to challenge their strength and focus. Teach crow pose to tripod headstand back to crow pose. From crow pose teach a jump/float back to chaturanga and then forward to crow pose. Offer up a bakasana fusion pose like: half tittibasana and half crow pose or half lolasana and half crow pose. For students that have the strength and would like a challenge offer Eka Pada Bakasana (one legged crow pose). Autumn is available for yoga instructors seeking mentorship. Have questions? Reach out and connect.